This photograph was taken on 21st January 2010, in a very soggy abandoned asylum in Wales – I probably ought to be posting it tomorrow, but here we go. This beautiful bird (is it a Swallow? a Swift? a Housemartin? I wish I knew), lying dead on the windowsill, it’s feathers soaking wet, had no doubt died of exhaustion after flying in to this building through an opening, then battled fruitlessly to escape. He or she could see the outdoors from within, could feel the brightness of the sun pouring in through the window, but could not get past the cold and unforgiving panes of glass. This is one of the saddest things I have seen during my urbex travels over the past couple of years – I almost decided against photographing it because it upset me so much, but equally I felt it was important to try and capture this feeling. 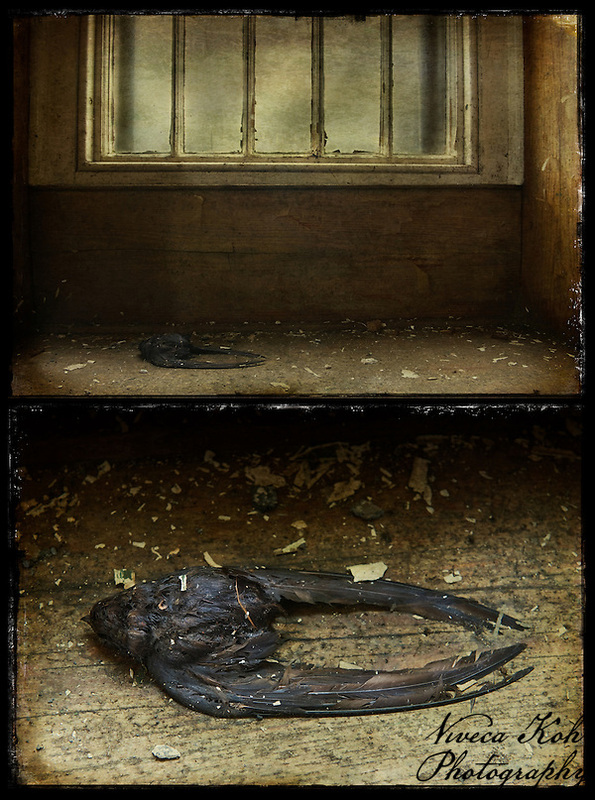 I made this image a diptych as I wasn’t sure that the top photograph was clear enough as to what was lying there on the windowsill. However, now that I have finished the piece I am not so sure and wonder if the top shot could work as a standalone image? But then again, whilst it gives the bigger picture, context, it doesn’t show the detail of the bird which I feel has to add an extra poignancy and therefore am confident that the two work perfectly together. p.s. the title of this image is courtesy of Roy Batty in ‘Bladerunner’ (one of my all time favourite films) – I’ve been waiting for some time to use it, and then this image came along. This entry was posted on Thursday, January 20th, 2011 at 18:41. It is filed under Asylums, Urban Exploration and tagged with diptych, Fine Art, Photography, Urban Exploration, UrbEx. You can follow any responses to this entry through the RSS 2.0 feed. Thanks Chris and Mark (love the Batman observation! ), that really does confirm to me that the diptych works best in this instance. I don’t see enough detail in the top image to tell what it is, or even that it was once living. It might have looked, oddly enough, like a weapon from Batman’s utility belt. I think the diptych works because the bottom image helps you to see what it is and the upper one provides the sad context. I love that you used a diptych for this. I think it works well. I have a similar situation where I have a room and I want to do a close up of something and I think this is the perfect way to do that. Great work! Thanks friends for your very valued feedback on this one, the different responses I have received have made an interesting debate. Whilst I am still vacillating a bit between both together or the top image on its own, I think that Barbara’s comment sways it for me, and I will be leaving the image as a diptych for now. Oh Viveca, this is such a sad, beautiful study. I think that the two images are important; this first to provide perspective, the second to provide truth. Your respect for the struggle, of what ever have happened, is evident. Thanks for sharing the angel with us. I like the way the second image is the closer look the first image draws you to want to take. I think it’s a swift from the huge wings and tiny beak. My eyes struggle to tell what it is in the upper picture. Had you not shown the bottom one, it would have been a bit of a mystery, but that could have been your intent. I like what you did, but I think I would have been okay with just the first image. Mystery, sadness…kind of interesting to just look at it and then try to interpret what you are really seeing. I like the mystique that only the top image can bring. Both images do a good job of telling the full story, but for me, the mystery of what is laying there adds to the overall feel of this image.